Original story: Atari’s went and dragged Eden Games’ second shot at an open-world racer, Test Drive Unlimited 2, out of the vagueness of ‘Q1 2011’ and slapped a proper date on it. The lifestyle sim will be out in North America on February 8 with retailers and Atari itself now taking pre-orders. Those after some exclusive vehicles or an in-game casino, see all the details below. No formal EU date yet, but chances are it’ll be later in the same week. Amazon.com pre-order shoppers will receive the iconic Aston Martin V12 Vantage Carbon Black special edition, exclusive avatar apparel and an additional bonus of Amazon Video Games Credit. The carbon edition features a bespoke Carbon Black color scheme, distinctive carbon fibre details, black mesh components, and high polish black 10 spoke diamond turned alloy wheels. A bright finished grill and front parking sensors complete the exterior detailing of this hand crafted masterpiece. Amazon customers receive an exclusive apparel item for their avatar to compliment the Carbon Black package on their Vantage V12. Customers who pre-order on Atari.com will unlock the impressive Ford Shelby GT 500. The rebirth of a legend, this reinvented Shelby delivers classically inspired styling and a supercharged engine. The rear-wheel-drive Ford Shelby GT500 is one of the all-time greatest muscle cars ever to hit the pavement. Draped in prestige, and history, tame this masterpiece of modern American muscle and tear up the roads of TDU2. Best Buy pre-order consumers will be rewarded with the Aston Martin DBS Carbon Black special edition – Aston Martin’s ultimate sports car, and a Carbon Black themed apparel item for their avatar. Featuring bespoke Carbon Black metallic paint complimented with gloss black 10 spoke diamond turned alloy wheels and the iconic Aston Martin side strake fashioned from carbon fibre. Customers will also receive a piece of exclusive Avatar apparel to compliment their new ride. Best Buy Reward Zone members also receive a significant bonus in reward zone points with their TDU2 pre-order. Atari fans that pre-order from Direct 2 Drive will receive the Jaguar XKR with Speed Pack and Black Pack. The XKR speed pack increases maximum speed from 155 mph to an awe-inspiring 174 mph. In addition, the Black Pack is a sleek, black custom package that includes a unique, aerodynamic body kit with front splitter and larger rear spoiler, body colored rear signature blade and diffuser, side sill extensions, gloss black front grilles, air intakes and 20” Kalimnos gloss black alloy wheels. An “XKR” side graphic has also been added. Pre-order customers will receive an exclusive shirt for their avatars that compliments the jet black cloth seats, steering wheel, shift knob and center console. The TDU2 Casino Online is a fully functional add-on product for Test Drive Unlimited 2, this valuable game mode is available as a pre-order bonus exclusively to GameStop customers. Unlock this fully interactive in-game environment to play popular casino games, meet up with friends, and more. Players who master the table games in the casino can unlock TWO unique vehicles, the Audi R8 Spyder and the Spyker C8 Aileron Spyder. 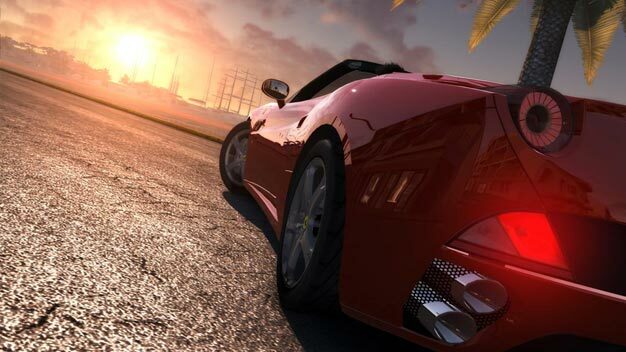 Casino owners can even win additional money to spend on your cars, properties, and avatar in the world of Test Drive Unlimited 2. Pre-orders at K-mart will unlock the Ferrari 612 Scaglietti. The design, especially the large side scallops and the headlights, pay homage to the custom 1954 Ferrari 375 MM that director Roberto Rossellini had commissioned for his wife, Ingrid Bergman. The car is capable of speeds up to 196 mph and can reach 60 mph in just 4.2 seconds. This grand tourer is unique as a true 4 seater with adequate space in the rear seats for two adults. Only sixty of these rare masterpieces were built (60 units) to commemorate the 60th anniversary of the company. Steam pre-order customers receive the special edition Pagani Zonda Tricolore. The Pagani Zonda Tricolore is a high end performance coupe produced in extremely limited numbers by revered Italian manufacturer, Pagani. The ultra-exclusive Zonda Tricolore is both a savory treat and a spectacular sports car, built to commemorate the 50th anniversary of Italy’s Frecce Tricolori, the nine-plus-one aerobatic training squadron based at Rivolto Air Force Base in northern Italy. Steam customers will also receive a stylish pullover to wear when driving this exclusive masterpiece, highlighting the unique design features and striking coloring of the Zonda Tricolore. Walmart.com pre-order customers will receive the Bugati Veyron Supersport 2010. This beloved supercar has been clocked as one of the fastest production vehicles in the world, setting a previous street record at 267.86mph. The Supersport packs an impressive 1200 HP that can launch this fireball from 0 to 60 in 2.2 seconds.